Several media outlets and internet users claimed that Facebook and Instagram had "unverified" Venezuelan President Nicolás Maduro's accounts Wednesday and given "verified" check marks to those of National Assembly head Juan Guaidó. This is false: Maduro was never certified on those platforms, and Guaidó was already certified before Wednesday, when he declared himself interim president of the country. Did Facebook and Instagram, in their own ways, officially recognize Guaidó as Venezuela's new president and signal that the social media networks would no longer acknowledge Maduro's power? That's what several posts shared across Twitter, especially in Spanish, implied. The messages seemed to say that Facebook and Instagram had revoked Maduro's verification and granted it to Guaidó. Verifications are indicated by a small blue icon next to users' names. Many social media users appeared to believe this information, which was repeated by Spanish, French, Russian, Portuguese and English-language news outlets, was true. 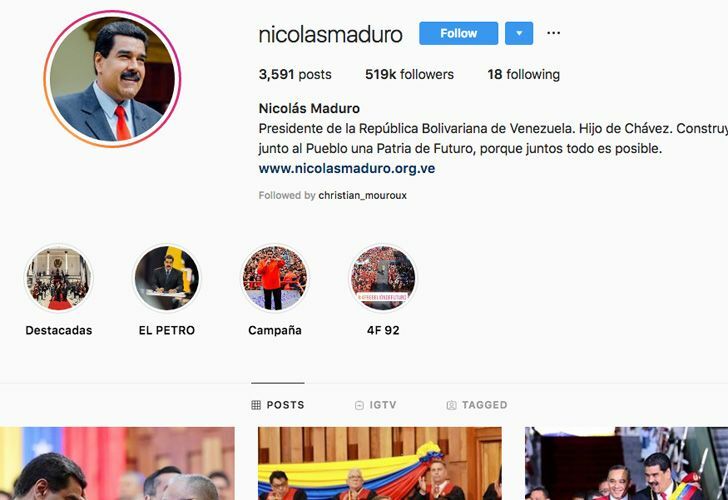 Thanks to the Internet archive tool the Wayback Machine, a site that allows users to view older versions of web pages, it's possible to see that the head of the Venezuelan government's Instagram account was not verified as far back as October 6, 2017. It's the same on Facebook: Maduro's page wasn't ever verified even before Wednesday, as is possible to see on a view of his page saved January 22, 2019, the day before the rumours said he was "unverified." Tweets showing screen shots from 2016 and 2017 and Google Images searches here and here show he wasn't verified on Facebook then either. 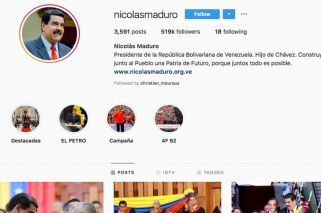 "Nicolás Maduro was not verified on Instagram or Facebook, and we did not remove verification from his account," an Instagram spokeswoman said in an email statement to media. "Juan Guaidó was verified on Instagram in November 2018, and he was verified on Facebook more recently." Facebook and Instagram have not taken any measures to verify or "unverify" accounts of people involved in the political events in Venezuela. The networks did not "unverify" Maduro Wednesday or Thursday – he was never verified on those platforms. And Guaidó was not newly verified Wednesday or Thursday – he already had the blue icon next to his name on those platforms before he declared himself Venezuela's interim president. The Instagram spokeswoman explained the verification marks are to show that users are who they say they are, not a value judgment of those users. "We want to make sure that people know they are following the authentic presence of a public figure, celebrity or brand on Instagram and Facebook," she said. "Verified badges are used to confirm that an account or page is authentic."